Earlier this fall, the new Showtime series Kidding had its series premiere, pulling in around 443,000 viewers. In the weeks since, the show now regularly pulls in about 2.3 million viewers each week through its TV and digital platforms. Starring executive producer Jim Carrey, the series has clearly proven to be a big hit for the network, and as of today, Showtime has gone ahead and officially renewed the series for a season 2. Considering the series has only been on the air for just over a month, this growth is incredibly remarkable, so the news about Kidding's renewal doesn't come as a huge surprise. Taking place in Columbus, Ohio, the series stars Carrey as Jeff Piccirillo, known professionally as children's entertainer Mr. Pickles. Inspired in part by Mr. Rogers, the cheerful TV host's life takes a turn for the worse when he loses one of his children in a tragic accident. This leaves Jeff feeling lost and heartbroken, straining both his personal and professional relationships. 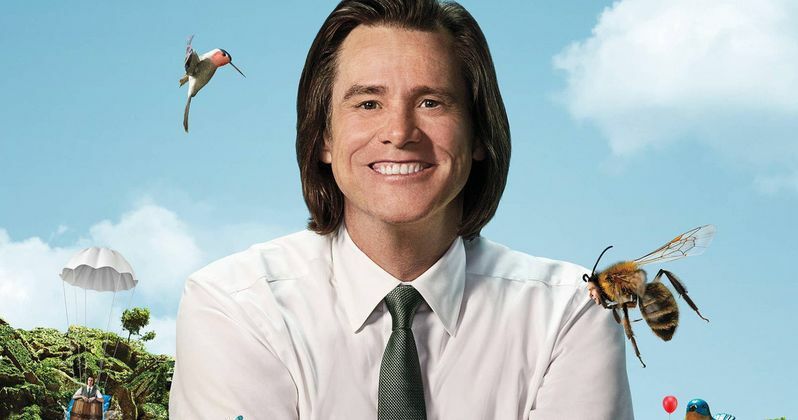 Supporting Jim Carrey in the cast are Judy Greer as his estranged wife, Frank Langella as Jeff's father, Cole Allen as his surviving son, and Catherine Keener as Jeff's sister Didi. Although the show begins in a rather dark way, Kidding manages to balance plenty of comedy along with its drama, and the show is just as compelling as it is addictive to watch. With so many fans taking to Carrey's character so well, the potential is there for this to become a new top series for Showtime. The network's President of Programming, Gary Levine, spoke about the decision to renew the show with an official statement. "Kidding has established itself as one of the most endearing and inventive shows on television. I feel like I have been watching Mr. Pickles my whole life, and I look forward to being entranced by his unique blend of hilarity and heartbreak in Season 2." This news comes at a great time for Showtime, considering the network's choice to cancel I'm Dying Up Here, which was also executive produced by Carrey, after just two seasons. Their flagship series Shameless has also been recently hit with two major losses, as Emmy Rossum and Cameron Monaghan have both announced their departures from the show. With the future of this important series now uncertain, the network was no doubt hoping to find something new that's just as big of a hit, and might have found just that with Kidding. Not since the early '90s has Carrey starred in a recurring role on a television series. The famous comedian got his first big break on the sketch comedy show In Living Color, before then quickly moving on to an impressive career in film. The actor can be seen every week on Kidding before its freshman season finale on Nov. 11, and the Showtime series will return in 2019 with ten all new episodes. This information comes to us from Deadline.